Katsuya Shimizu of Osaka University in Japan has been named recipient of the 2018 Bernd T. Matthias Prize for Superconducting Materials. Katsuya Shimizu of Osaka University in Japan has been named recipient of the 2018 Bernd T. Matthias Prize for Superconducting Materials. Shimizu works at the Center for Science and Technology under Extreme Conditions at Osaka University. The prize was created in 1989 by friends and colleagues of Bernd T. Matthias, a German-born physicist who immigrated to the United States in 1947 and is noted for his discovery of nearly 1,000 superconducting materials. The Texas Center for Superconductivity at the University of Houston (TcSUH) has sponsored the prize since 2000. In recognition of the prize, Shimizu received $6,000 and a special framed certificate designed by science publisher Elsevier B.V. 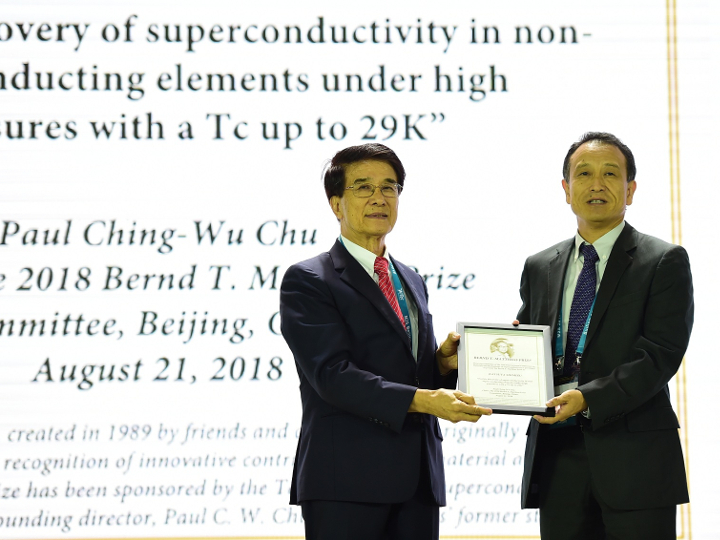 The 2018 Matthias Prize was presented last month at the 2018 M2S-HTSC international conference in Beijing. The H. Kamerlingh Onnes Prize and the John Bardeen Prize were also presented at the conference, and the recipients each gave a special lecture. Shimizu was honored for his discovery of superconductivity in non- superconducting elements under high pressures with a Tc up to 29K. More information on the conference and the 2018 Matthias Prize may be found here. 2018 Matthias Prize committee members are Paul Ching-Wu Chu, chair, TcSUH; Ivan Bozovic, Brookhaven National Laboratory; Hideo Hosono, Tokyo Institute of Technology; Frank Steglich, Max Planck Institute for Chemical Physics; and Zhongxian Zhao, Institute of Physics, Chinese Academy of Sciences. Susan Butler of TcSUH serves as Matthias Prize coordinator. 2018 M2S Conference chairs were Xingjiang Zhou and Zhongxian Zhao, Institute of Physics, Chinese Academy of Sciences, Beijing. Bernd Teo Matthias (1918-1980) was born in Frankfurt am Main, Germany, on June 8, 1918. He completed his Ph.D. in physics in 1943 at the Eidgenossische Technische Hochschule Zurich and continued his research there for four more years. He immigrated to the United States in 1947 and was elected to the National Academy of Sciences in 1965. He is most noted for his discovery of nearly 1,000 superconducting materials. In 1961 he joined the physics faculty at the University of California, San Diego, where he founded the Institute for the Study of Matter, funded first by the Air Force and later by the National Science Foundation. In 1966, the Institute merged with the Physics Department's Institute for Pure and Applied Physical Sciences and Matthias became associate director. He was still actively researching and teaching when he died of a heart attack on October 27, 1980. TcSUH is the largest multidisciplinary university-based superconductivity and advanced materials research center in the U.S., with more than 280 faculty, postdoctoral fellows, graduate and undergraduate students. The Center’s personnel create and develop high temperature superconducting and advanced materials, further their understanding, and develop commercial applications.